This is the Codebook for the Survey of Long-Term Care Awareness and Planning public use file, and Appendix B of the report "Data User's Guide for the Public Use File of the Survey of Long-Term Care Awareness and Planning". The Codebook contains every variable name, its label, and unweighted and weighted frequencies. 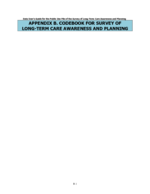 "Data User's Guide for the Public Use File of the Survey of Long-Term Care Awareness and Planning" is available at https://aspe.hhs.gov/basic-report/data-users-guide-public-use-file-survey-long-term-care-awareness-and-planning.